Why should you order Wedding Marriage Milestone wine bottle labels? BONUS - 6 Different Milestone Stickers! Our wine bottle labels are the perfect addition to your engagement party, bridal shower, wedding shower, bachelorette party, and more! 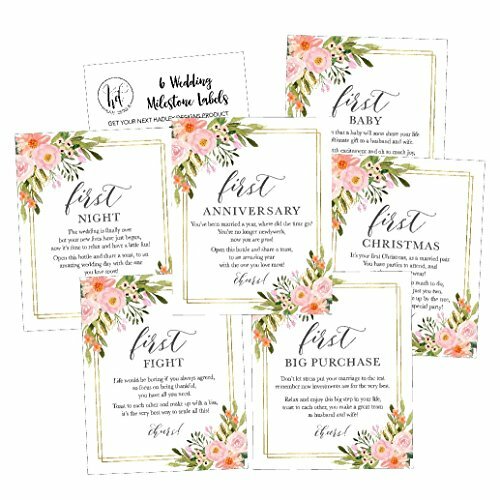 These are the perfect gifts and presents for the maid of honor or bridesmaids to give to the bride and groom on the wedding day. Fun sentimental gift idea for the newlywed couple even though it probably is not on their gift registry. Thoughtful year of firsts or 1st wedding gift favor tags. These can be the best cute wine bottle cover sticker basket and bag. Great gift for bride or wife to give to her groom or husband. Get these perfect labels for your husband or wife, friends, family or parents or grandparents! These are the best gifts for under 15, 20, 25, 30, 40, 50 dollars! All of our labels have been designed by our own personal in house graphic designer to specifically fit standard 750ml wine bottles! What text is on the bottles? PERFECT KEEPSAKE - The Bride and Groom can put them in a scrapbook or photo album & re-read the marriage first's milestones every year and remember those special occasions together. EASY TO USE - WATERPROOF & DURABLE - Each label is printed on high quality waterproof material MADE IN USA. Just peel and stick to your favorite bottle. Remove original label for best results. DELIGHT THE COUPLE: Leave the boring greeting cards and shirts to other guests and give the couple a gift they'll laugh and remember for years to come! Every couple will be able to relate to each sticker! These are perfect for any wedding related event, bridal wedding shower, bachelorette party, engagement party, reception and more! LOVE THE DESIGN & QUALITY OF THE LABELS OR YOUR MONEY BACK! Add to Cart Now!